In the 1980s, a moral panic swept the United States. Rumours swirled of a vast underground network of devil worshippers, and claims of Satanic Ritual abuse flooded the airwaves. Role-playing games were gateways to black magic, and backwards messages, hidden in heavy metal music, spurred teenagers to Satanism or suicide. The devil was everywhere and something needed to be done. In response to the growing public fears, the FBI assembled a taskforce to investigate occult activity. 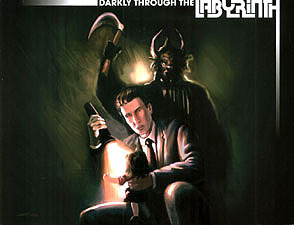 Darkly Through the Labyrinth is a role-playing game where players assume the roles of FBI agents assigned to this special taskforce. They investigate doomsday cults, fringe religious groups, and ritualistic crimes. Darkly Through the Labyrinth is a horror game, but the monsters are human. The evils perpetrated upon society are entirely man-made; there is no supernatural agency at work. The enemy is one of us.